Charles played 8 seasons in the NFL from 2002-2009. He recorded 424 total tackles, 47 sacks, and 16 forced fumbles over his career. He was selected in the first round of the 2002 draft by the New Orleans Saints with the 25th overall pick. Over his college career at Georgia, Grant posted 136 tackles and 15 sacks. He received a Super Bowl ring for being a member of the New Orleans Saints 2009 NFL Championship run. After the season he’d be released by the team. 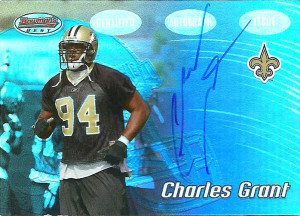 Charles appeared on the rosters briefly of the UFL Omaha Nighthawks, the Miami Dolphins, and Chicago Bears, before retiring in 2010. After his playing days ended, Charles has been spotted coaching football in the Baltimore area.